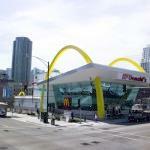 *McDonald’s is getting tired of the old look and trying to step into the new millennium. Several of the franchise’s locations have already been updated and are reaping the benefits of the new look. One of America’s favorite fast food chains may not be recognizable from the details given so far.